Two weeks ago, I spoke in Bonn, Germany, at the UN Climate Conference. There I was — an American — in this post-Trump world — describing the progress we’re making in Los Angeles on climate change. I told the group of 200 people about Climate Resolve’s innovations in developing cool roofs and cool streets, and in building robust climate collaboratives. Since Trump’s election, it has become abundantly clear that climate action is under assault from climate deniers in Washington, D.C. So it felt good to speak at the United Nations — to be a force for good — especially in the wake of Trump’s actions. I’m now asking you to do your part in stemming the darkness. I am asking you, today, to give to Climate Resolve. Your support can help us continue to make progress, despite Trump’s radical agenda. Climate Resolve is bringing Americans together — and finding new ways for people of all persuasions to work on climate solutions. While talking to others in Bonn who are pursuing climate solutions and making climate progress, I was reminded about how lucky we are to live in California, where citizens understand we need to act on climate and our elected leaders are doing just that. I’m grateful. Which brings me to Thanksgiving. 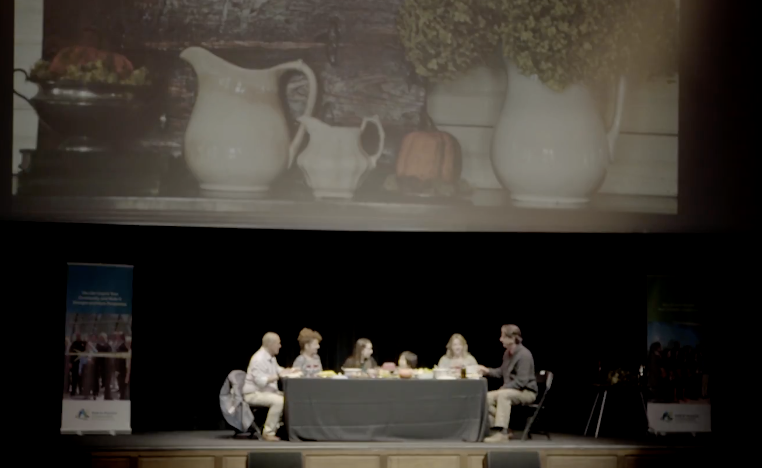 Before this Thursday, check out the short play we wrote about Thanksgiving. Performed at Climate Day LA, the video is only ten minutes long. It may make you laugh and it may move you. You’ll definitely pick up tips on how to talk about climate with your crazy Uncle Joe. In the coming year, Climate Resolve will be redoubling our recruitment and educational efforts. We’re speaking at dozens of community meetings — neighborhood councils, houses of worship, professional groups and schools — with a smart curriculum that places Angelenos in the climate picture and further gives people tools to affect change. We need your help — we need you to join the resistance. Progressive forces need to prevail in Sacramento and in Los Angeles. And we can’t succeed without you! Again, I’m asking you to please give to Climate Resolve today.